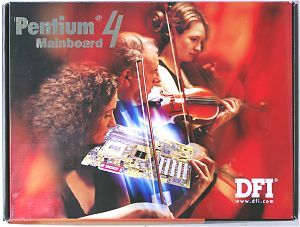 Boards from this company have never been very famous or speedy; nevertheless, this one can be a good choice for those who are looking for an inexpensive solution. The layout is not the best: the FDD connector is behind the PCI slots, and it can be difficult to reach if full-size expansion slots are installed in these slots; the power connector is behind the memory slots and this will hamper operation of the memory; CD-in connectors are in front of the PCI slots. It's not difficult to reach switches and jumpers, but their functions are not shown on the textolite. 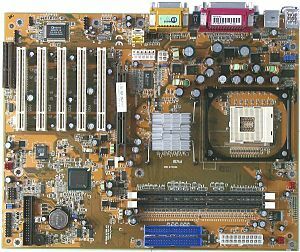 The board uses three power connectors complying with the ATX 2.03 standard (including the rare Auxiliary Power). The 3-channel switching voltage regulator incorporates 14 capacitors of 2200 uF. The following controllers are integrated: an audio one based on the chipset's capabilities and Avance Logic codec (ALC201A). Although we have a production sample, there are several switches meant only for the manufacturer which leaves the impression that the board is not finished, especially taking into account the results. The system monitoring is supported by the Winbond W83627HF-AW chip. Processor and battery voltage (+/-3.3, +/-5 and +/-12 V), speed of 3 fans and temperatures of the processor (a built-in sensor) and the board (a built-in sensor) can be controlled. There are 3 connectors for adjustable connection of fans. 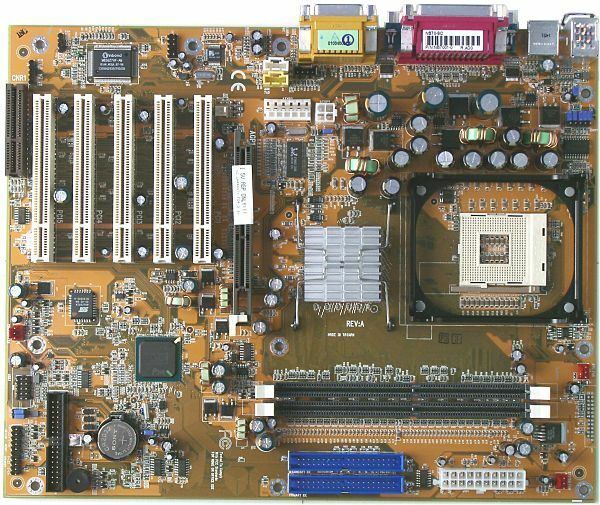 Brief characteristics of the board: memory slots - 2 DDR SDRAM; expansion slots - AGP/ 5 PCI/ CNR; I/O ports - 2 COM/ LPT/ 2 PS/2/ 4 USB 1.1; dimensions - 305x245 mm. We used the latest available version of the BIOS of 20/11/2001. The board falls considerably behind its competitors in some applications, it may require a newer BIOS version to improve it. And now the board can be taken due to its low price.